Aotearoa Southport Bed & Breakfast, Southport | Fabulous Food! At Aotearoa Southport, we are specialists in food allergies. So if you suffer from any allergies, you will be well cared for here. We offer Gluten Free, Wheat Free, Dairy Free, Vegetarian and Vegan options if you can give us advance warning. We are Celiac cooking trained in food storage, cross contamination and food serving, and as I also have food allergies, I am aware of the importance of creating healthy dishes that work with the allergy sufferer. We have been nominated this year in the Eviivo Tastiest Breakfast Award and are featured in Eviivo's Charity Cookbook called "Great British B & B Breakfasts - Not your average fry up". What are you waiting for? You definately won't be disappointed here! Tasty, Different Dishes for Breakfast! 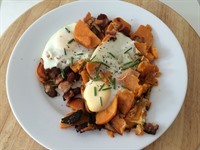 Want to try something different for breakfast? Italian Baked Eggs - Chorizo, Sausage, Tomato, Spinach and a Dairy Free Sauce with eggs. Baked in the oven with italian spices - YUM! 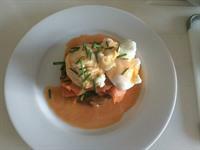 Eggs Benedict with Diary Free Hollandaise Sauce - fancy bacon or smoked salmon - you choose! Special Scrambled Eggs - you choose goats cheese or smoked salmon and freshly chopped spinach. Fancy Cereal - we make our own gluten free, wheat free, dairy free Granola here - served with coconut yoghurt and fresh berries or seasonal fruit. If English Breakfast is your thing, then try out Healthy Full English - Gluten Free local Sausages, Bacon, Mushrooms, Grilled Tomato and either Scrambled Egg with Spinach or Poached Eggs.